The inferno that recently destroyed over 90% of Brazil’s National Museum’s collection has once again shown how ephemeral physical objects are. In order to preserve cultural heritage museums generate digital archives, but what about exhibiting lost art? Is augmented reality a possible solution? Or should we just deal with never again being able to display and see historical treasures like “Luiza, the oldest human fossil in the Americas” (Solly)? Hacking the Heist, developed by Cuseum, is a recent example of reviving lost exhibits via AR. The project returned stolen paintings to their frames. Would this also work for other museums that have lost parts of their collection? Or is the aura of an original simply irreplaceable, as Walter Benjamin would argue? What is gone is gone, at least physically. However, in Rio local students and Wikipedia have started to build up digital galleries showing the lost exhibits. On platforms like Wikimedia Commons they are gathering contributions by people who had taken pictures of the objects (Solly). Atlas Obscura’s Sarah Laskow notes that these photos “preserve, at least in some form, what remains of the history the museum was meant to protect”. Indeed, protection of artworks and artifacts is one of a museum’s main responsibilities. The others however include educating visitors by exhibiting these objects (Kramer, Langenbacher 13). Especially with natural history museums, browsing through an online-archive is not too exciting. We want to experience history, see a 12.000-year-old fossil in real life. So there must be a way of exhibiting in the actual museum, not only online. The discourse around AR in the museum and tourism context has long started (Chung et al. 588). Yet, in 2015 Chung et al. note that “AR is not being actively used, and … it is appearing more slowly than expected” (Ibid.). Another three years later, Cuseum’s CEO Brendan Ciesko states that now is the time to seize the technology’s opportunities in museums, since “companies like Apple and Google are putting vast resources behind augmented reality and encouraging developers like us to experiment”. The Isabella Stewart Gardner Museum in Boston fell victim to the biggest unsolved art heist in history. In 1990, 13 paintings by artists like Rembrandt van Rijn were stolen. Since the museum’s director had ordered not to remove the empty frames of the paintings, Cuseum had the idea to fill these frames and developed an application using Apple’s ARKit1.5. Visitors, looking through their phones’ or tablets’ displays, could now see the paintings hanging on the wall again. She has a point – why leaving the house to look at virtual replicas of exhibits when you could also Google 3D models and images of them at home? Generally, why is it important to maintain the physical museum when it would undoubtedly cost a fortune to renovate a massive building such as the Museu Nacional? There are many factors to take into account when considering applying Cuseum’s rather small experiment to the hundreds of destroyed artifacts in Rio. For one, the quality of the AR versions and the user friendliness must be on point in order to have an authentic experience. Secondly, it is highly risky to invest in renovating a building that will apparently host more virtual than physical items. Here lies the general conflict between originals (buildings and objects) and technical reproductions that has been discussed for many years. Concerning the quality of the AR component I do not see any issues. Looking at the latest version of Apple’s ARKit2, it seems that it is already possible to create perfect replicas of the exhibits. Since the content is registered in 3D (Azuma 356), and luckily there already exist decent 3D models of the items, “including fossils, Egyptian mummies, the Luiza skull … and Greek and Roman artifacts” (Solly), introducing AR with ARKit or e.g. Google’s ARCore could be immediately realized in the Museu Nacional. I say in this case there is not even the need for fancy extras like ARKit2’s USDZ format, which offers impressive animation functions. The existing technologies provide all it needs for putting the objects back on their pedestals: shadow casting, perspective and an accurate size ratio. Surely, the haptic of a physical exhibit is missing, but normally you are not allowed to touch them anyway. So far, in many cases AR is used to experience history in an interactive way, also aiming at new audiences (tom Dieck, Jung 110), but what if it is not about fun and interactivity but about trying to get the best possible replacements aiming at accuracy and authenticity? Will public museums, which are clearly not the wealthiest institutions, ever invest in this? In the case of the Museu Nacional it would primarily mean a considerable investment into rebuilding the museum itself. The easy and affordable alternative would be sticking to an online gallery and letting go of the building. Werner Schweibenz writes about this “virtual museum” that it lacks the basic prerequisite of a museum – the object itself (7). Yes, digital archives do not host physical objects. However, in Rio or in Boston we do not find them in the actual museum either. This is an issue that media theorists and art historians like Hans Belting and Walter Benjamin have not considered when purporting the aura of the original is destroyed by technical reproductions (Benjamin 213). Belting argues that the “physical things and their aura” get “lost in the information society” and wants at least the physical space to be maintained, giving original artworks a worthy location to be presented (39). I suggest that even if the originals are literally lost, the physical space can still support or enhance the experience of engaging with technical reproductions. Opting for an authentic experience of seeing art and historical objects the context and environment is essential. The frames, pedestals and stands, as well as the remaining original exhibits in the museum are the reality that has surrounded the lost art. AR cannot fully replace the objects but it can augment this reality, leaving the most authentic impression possible in this exceptional situation. Azuma, Ronald T. “A Survey of Augmented Reality.” Presence, vol. 6, no. 4, 1997, pp. 355-385. Belting, Hans. “Das Museum als Medium.” Die Zukunft der Alten Meister, edited by Ekkehard Mai. Böhlau, 2001, pp. 31-43. Benjamin, Walter. Das Kunstwerk im Zeitalter seiner technischen Reproduzierbarkeit. Suhrkamp, 2013 (1936). “Category:Museu Nacional, Rio De Janeiro.” Category:Heidentor (Carnuntum) – Wikimedia Commons, Sept. 2018, commons.wikimedia.org/wiki/Category:Museu_Nacional,_Rio_de_Janeiro. Accessed 18 Sept. 2018. Chung, Namho, et al. “Tourists’ Intention to Visit a Destination: The Role of Augmented Reality (AR) Application for a Heritage Site.” Computers in Human Behaviour, vol. 50, 2015, pp. 588-599. Science Direct, doi: 10.1016/j.chb.2015.02.068. Accessed 18 Sept. 2018. Ciecko, Brendan. “Museums Are the Best Place to Find Innovation in AR.” VentureBeat, VentureBeat, 29 Mar. 2018, venturebeat.com/2018/03/27/museums-are-the-best-place-to-find-innovation-in-ar/. Accessed 18 Sept. 2018. Cuseum. “AR Demo of Rembrandt’s ‘A Lady and Gentleman in Black’ Returned to Frame.” Vimeo, 18 Mar. 2018, vimeo.com/260604736. Accessed 18 Sept. 2018. Flynn, Thomas. “Museu Nacional Do Rio De Janeiro – A 3D Model Collection by Thomas Flynn (@Nebulousflynn).” Sketchfab, 2018, sketchfab.com/nebulousflynn/collections/museu-nacional-do-rio-de-janeiro. Accessed 18 Sept. 2018. Kramer, H., Langenbacher, C. “Digitale Strategie.” Open Up! Museum, edited and published by MFG Innovationsagentur Medien- und Kreativwirtschaft Baden-Württemberg, 2016, pp. 9-17. Kraus, Rachel. “Bring on Museum Companion Apps – but Only If They’re Absolutely Awesome.” Mashable, Mashable, 21 Apr. 2018, mashable.com/2018/04/21/museum-companion-apps/?europe=true#KiL1lfV1yaqh. Accessed 18 Sept. 2018. Laskow, Sarah. “Students Are Collecting Photos to Remember Brazil’s Destroyed National Museum.” Atlas Obscura, Atlas Obscura, 4 Sept. 2018, www.atlasobscura.com/articles/students-collecting-photos-of-museu-nacional. Accessed 18 Sept. 2018. Schweibenz, Werner. “Das virtuelle Museum. Überlegungen zum Begriff und Wesen des Museums im Internet.” Museum and the Internet, May 2001. mai-tagung.lvr.de/media/mai_tagung/pdf/2001/schweibenz.pdf. Accessed 18 Sept. 2018. Solly, Meilan. 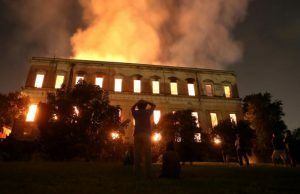 “Five Things We’ve Learned Since Brazil’s Devastating National Museum Fire.” Smithsonian.com, Smithsonian Institution, 7 Sept. 2018, www.smithsonianmag.com/smart-news/these-are-latest-updates-brazils-devastating-national-museum-fire-180970232/. Accessed 18. Sept. 2018.
tom Dieck, M. C., Jung, T. H. “Value of augmented reality at cultural heritage sites: A stakeholder approach.” Journal of Destination Marketing & Management, vol. 6, no. 2, 2017, pp. 110-117. Science Direct, doi: 10.1016/j.jdmm.2017.03.002. Accessed 18 Sept. 2018. Vanian, Jonathan. “Apple Just Debuted Powerful New Augmented Reality Features.” Fortune, Time Inc., 4 June 2018, fortune.com/2018/06/04/apple-wwdc-augmented-reality-arkit/. Accessed 18 Sept. 2018. All direct, or indirect quotations by H. Kramer and C. Langenbacher, W. Schweibenz, W. Benjamin, and H. Belting were translated from German by the author of this article. « CareAI: A Solution for African Healthcare?